How Slowly Will We Grow? In the recently released March trend report, the Altarum Institute presents Q4 2015 data from the Quarterly Services Survey that confirms the continuation of the slowdown in growth that has occurred throughout 2015. Health care spending grew 4.6 percent in the fourth quarter, a far cry from the peak growth of 6.7 percent in Q1 2015. For the year as a whole, spending growth in 2015 exceeded growth in 2014 by half a percentage point (5.8% versus 5.3%), but growth declined throughout the year. The impact of coverage expansion appears to have largely run its course, as health care services spending growth declined sequentially during the four quarters of 2015, landing at 4 percent in the fourth quarter. Perhaps we are returning to the lower rates of growth in health care services spending which we experienced in 2013 and 2014, when spending growth rates were 3.0 percent and 4.2 percent, respectively. Figure 3 from the trend report gives a nice birds-eye view of where we have been and where we might be headed with respect to major components of national health expenditures. The broader timeframe adds a lot of useful context. 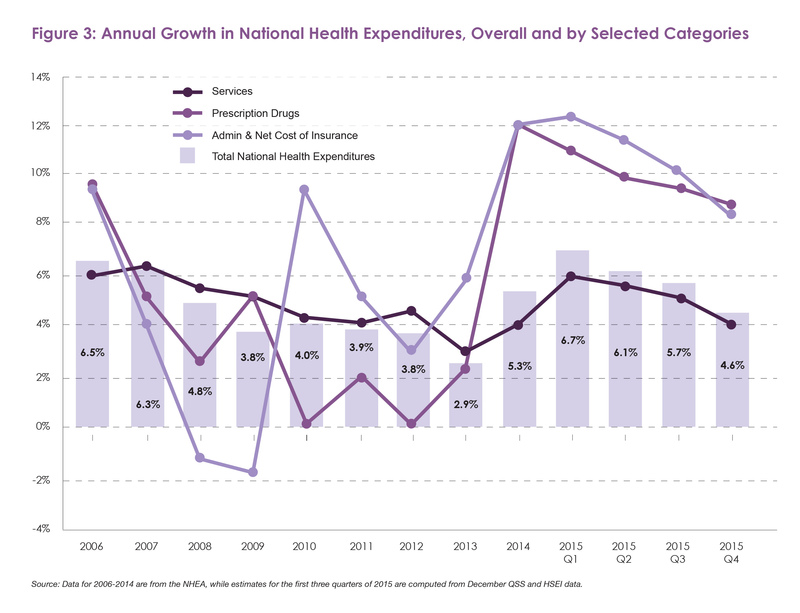 In fact, it appears that starting in 2006, spending growth on health care services has been slowly moderating, hitting the 4 percent mark in 2010 and hovering there for a few years, sliding even lower in the somewhat mysterious very-low-growth year of 2013. The subsequent increase in this component is a natural consequence of coverage expansion, but the sequential declines over the last four quarters suggest that perhaps we are returning to the slower growth regime of our recent past. Two other important components of national health expenditures bear some discussion as well. The net cost of insurance, although it accounts for less than 10 percent of national health expenditures, has been growing at a rate far above overall trend since 2014. Since the net cost of insurance reflects the administrative costs of insurance carriers and Medicaid managed care organizations (MCOs), we would expect spending growth on this component to bear some relationship to the pace of coverage expansion. As the percent of the population with insurance has grown, all else equal, we would expect that the net cost of insurance would become a larger share of health care spending. The medical loss ratio (MLR) regulations function to constrain the administrative costs of carriers, and new regulations will apply similar restrictions to Medicaid MCOs. While most states are gravitating toward managed care for their Medicaid programs, a notable exception is Connecticut, which is planning to return to managing utilization in-house. This by no means eliminates the cost of claims administration, (despite the claims of some single-payer advocates), but may present an opportunity to reduce these costs. This move, which may or may not be followed by other states, does reflect a growing recognition of the importance of that component of health care spending. Prescription drug spending is also a relatively small component of national health expenditures that has of late been way above trend-—driven in part by the impact of coverage expansion but even more by price effects, particularly the impact of several high priced new products. Yet both overall spending growth and prescription prices have declined over the past four quarters, and public outcry as well as increasing consideration of value-based strategies by public and private payers may succeed in slowing spending growth, although the potential for new products will always create a challenge. If we are indeed entering a slower growth environment, we would expect health care job growth to moderate. Altarum notes that we are already starting to see this happen, and we expect the trend should continue. Spending growth in hospitals in particular, declined significantly during 2015, from nearly 8 percent in Q1 2015 to approximately 3 percent by the fourth quarter, so we may start to see an impact on job growth in that sector. More broadly, the relationship between health care jobs and utilization, which is a rough proxy for labor productivity, has changed in recent years. Figure 9 shows how after years of similar rates of growth, utilization grew quite a bit more sharply than did jobs during the period of rapid coverage expansion. The rates converged in Q4 2015, and the ratio of services to jobs actually declined between the third and fourth quarters, although these crude ratios mask many different production functions in different parts of the industry. Overall, it appears that labor productivity has increased in health care, and this, in combination with the slower growth in utilization, would suggest that job growth in health care should be slowing. As increased utilization ceases to be a driver of growth, our attention naturally turns to prices. The last several years have seen extremely low growth in health care service prices, with rates of growth hovering around 1 percent and sometimes below. 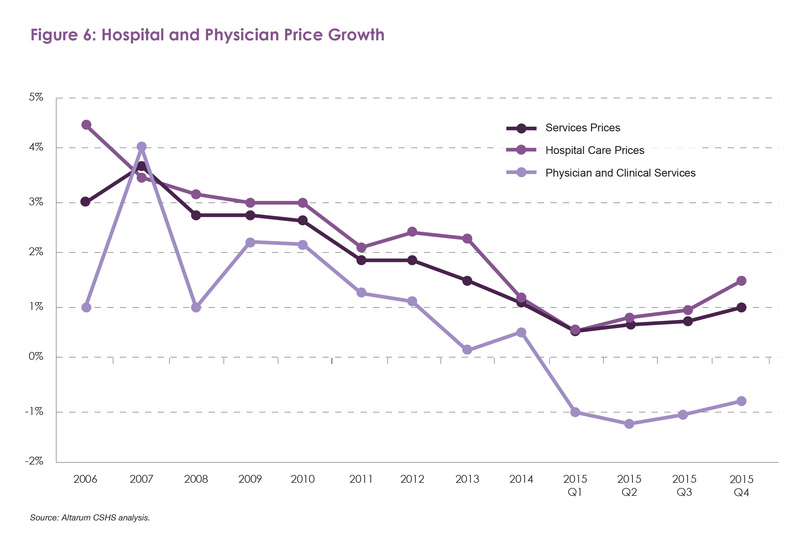 Taking another very helpful longer range view, Figure 6 shows the trend in hospital and physician prices since 2006, revealing a sustained decline in price growth throughout the period. Price growth reached a low during 2015, where it was actually negative for physician services. But it appears the series bottoms out in Q2 2015, after which we have witnessed a slight uptick in price growth for the last two quarters, perhaps reflecting the emergence from a sustained period of overall low price increases for the economy as a whole. This price trend bears watching, since moderating growth in health care service prices has been an important contributor to the slowing trend in health care spending growth that we have experienced more or less since 2006. Coverage expansion provided an expected shock to that trajectory by boosting utilization significantly. But to remain on a path to slower growth, moderate price trends are essential.